I haven't gotten around to making many Easter cards this year but here is one I have made. 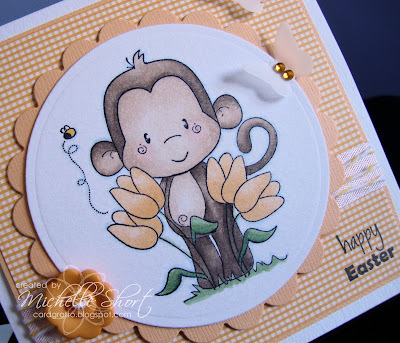 I have used the very cute CC Designs Tulip Monkey and stamped him with Memento Tuxedo Black and coloured him with Copics. I have then cut him out using Nestabilities dies and added him to base with 3D foam. The base is a sheet of Doodlebug Melon CS added to a white card blank and then a sheet of Memory Box Gingham Melon paper on top; wrapped around with TRG white Seam Binding and then yellow Devine Twine. A Doodlebug Boutique Button added with the twine and the greeting stamped from the CC Designs Amy R Spring Sentiments set. I have cut two butterflies out from vellum using the MFT Die-Namics Butterflies dies and added Prima Crystals to their centres. STAMPS: CC Designs. INK: Memento Tuxedo Black. 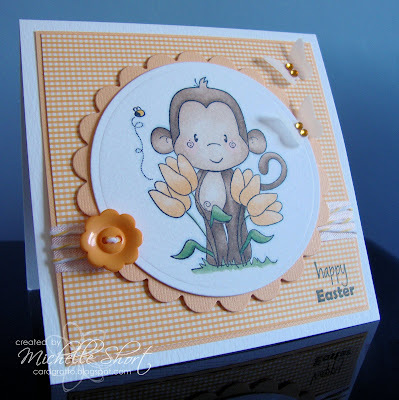 CS: Craftwork Cards, Doodlebug Designs, Memory Box, Paperchase Vellum. TOOLS: Nestabilities, My Favourite Things Die-Namics, Copics Markers - monkey: E41, E42, E43, E44, R000; tulips: YR21, Y23; leaves and grass: G21, G24, G28. EMBELLISHMENTS: Seam Binding and Devine Twine by The Ribbon Girl, Doodlebug Boutique Button, Prima Marketing Crystals. What a goorgeous card Michelle. Thank you ever so much Michelle, this card is just SO, SO sweet! I love the vellum butterflies with the bling and all the other lovely little details. The card is on display and we had visitors yesterday, they remarked on how lovely it was too!